TUCSON, Ariz. - A mass of motorcycles escorted the hearse on the ten mile trip from a funeral home in Oro Valley to the Tucson Convention Center---part of the surge of support fellow officers are quick to extend when one of their brothers or sisters is killed. Some civilians stepped out on the route to pay their respects too. “It was heartbreaking. We wanted to pay our respects,” said Trish Olivas. “We have all the respect in the world for our law enforcement and it's a sad day here in Tucson." 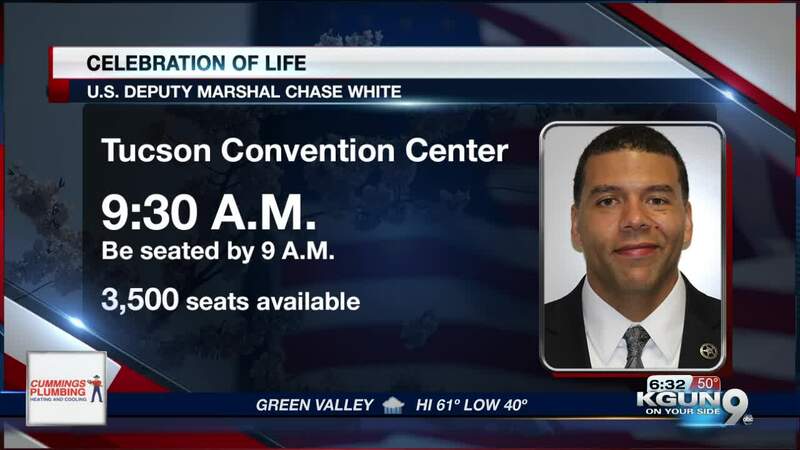 The procession stretched down Oracle, and moved into the Tucson Convention Center where hundreds of law enforcement officers gathered. The Marshal's Service provided photos of the celebration of life. Deputy Marshal White's family wanted no TV cameras in the ceremony but reporters were able to take notes on the speeches. Deputy U.S. Marshal Kevin Williams described Chase White running into traffic to catch a suspect who was running away. He remembers White saying later, "We take big risks but our mission is good." White's mother Lynnda thanked the law enforcement community for all the help it offered her family after Chase White was killed. But she noted the man charged with killing her son may have mental health problems and wishes the community had helped him in ways that might have prevented the shooting. She wants him to get help now, saying, "I want him to wonder how people could be so good to him when he took our heart."